You can make some really cute blue jeans placemat from your stack of old blue jeans. I don't like to throw away anything that I think can be used for something else that is useful. I have used the blue jeans to make rag quilts as well as aprons so I figured that placemats would look very nice and it also uses what you have left after making the aprons. Start by cutting the legs apart and decide what size you want your placemat. I made this one by cutting my blocks 8 1/2" X 7". You will need 8 blocks. I also used 2 different color of jeans but you can use the same color. Start by sewing your blocks together using a 1/4" seam. Sew the lights and darks together and then switching the blocks so that the colors are across from each other (check the picture). Make 2 of these and then you need to sew them together. Place your blocks back to back so that the seams are on the inside. 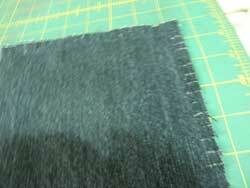 Sew all the way around the outside of the block with a 1/2" seam. 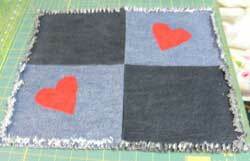 I also thought that the the blue jeans placemats need to be a little different so I appliqued some hearts on them. You can leave the applique off or use any kind of design that you like. Some leaves or small animals would look really cute on them. After you are finished with the sewing you need to clip the seam that you sewed around the placemat. Clip all around about 1/4" to 1/2" apart but be sure that you don't cut your seam. Now wash the placemat and you will see that the ends fray. The blue jeans placemat turns out really cute and you can make them really fast. Kids really like them and all you have to do is throw them in the washing machine and they come out really nice. They are just like a rag quilt. They get better each time they are washed.